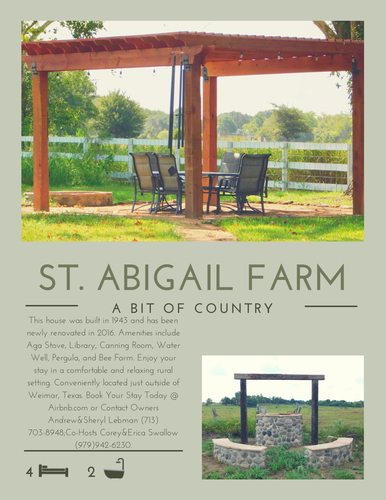 Saint Abigail Farm is a charming Bed and Breakfast located at 1555 FM 155 South outside of Weimar, Texas. The 2 bedroom, 2 bath house was built in 1943 and was newly renovated in 2016. It will accommodate 4 people. Amenities include an Aga stove, library, canning room, water well, pergola and bee farm. Enjoy your stay in a comfortable and relaxing rural setting. Book your stay at Airbnb.com or contact owner Sheryl Lebman at 713.-703-8948 or co-hosts Corey & Erica Swallow at 979-942-6230.